We have our own local challenges, with enormous structural change being pushed on us by the Tories in primary care commissioning, and our acute trusts merging. As chair of health scrutiny on the council I’m working to make people’s voices heard as change develops. 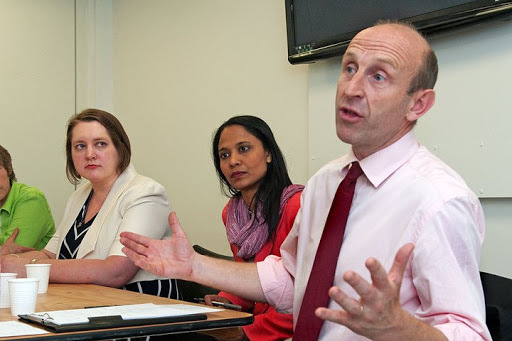 The Labour Party in Tower Hamlets will continue to campaign to protect our services – watch this space. The St Clements hospital site, on the south of Bow road, near the British estate Tescos, has been empty for some time. In the past it has been a workhouse, a hospital, and most recently, the site for NHS mental health services. It was built by public subscription, and the buildings and the land have always been used in public service, one way or another. When the NHS moved off the site the ownership reverted back to government, and now sits with the Homes and Communities Agency. Under Labour, HCA grants were the means through its social housing was built – now the Tories have cut their funding and are seeking to impose 80% market rents for new social tenancies, the HCA is a very different body. The East London Community Land trust, born out of London Citizens, is seeking to take on the site, create a form of collective ownership and responsibility and build social housing and business units which are badly needed. It really matters that this resource continues to be used for the public good. We don’t need more private flats with token social housing bolt ons – we need the St Clements building and space to go back to being an integral part of our neighbourhood. ELCT are the only means we have to achieving that, and I am supporting them. If you’re from east London, please do sign up on the link below to become a member. We can’t allow the HCA to just sell off this resource to the highest bidder, and if the ELCT is successful, the people of east London and especially Mile End East need to be members so we can shape its future. Fabulous day at the St Paul’s Way fete last week-thanks to Hannah and Michael for sorting it all out. This is me at our bookstall. Other stalls had gorgeous cakes and beautiful hand made cards. I felt like the Olympics was local to us for the first time with Tessa Sanderson opening the fete and handing out prizes. A lovely picture from the Bromley by Bow fete, where some kids ran into our photo and made it much more interesting. I’ve just been appointed to the board of the Bromley By Bow centre so it was an opportunity for me to see their mix of social entrepreneurialism and public service in action.